So, you find yourself reaching for comfortable precedents: graphite, large swaths of black paint, electrical tape. As for artists, well, Barnett Newman perhaps, or Ellsworth Kelly, only, you know, a lot more metal. 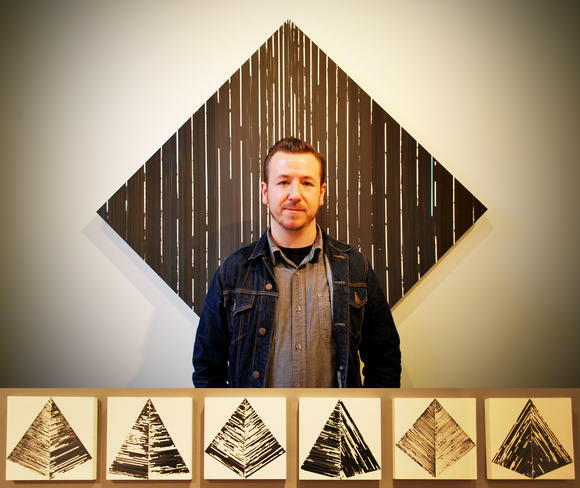 - See more at: http://www.citypaper.com/arts/visualart/bcp-terence-hannum-tells-us-were-all-gonna-die-using-dead-media-20141209,0,6952460.story#sthash.9c3WNzFA.dpufSo, you find yourself reaching for comfortable precedents: graphite, large swaths of black paint, electrical tape. As for artists, well, Barnett Newman perhaps, or Ellsworth Kelly, only, you know, a lot more metal.